"I received a nice compliment from a client for politely hounding him. I'm candid, detail-oriented and really good at keeping clients in the loop. It's important that they always know what's going on." Kelly has represented clients in admiralty and land-based tort actions and other complex litigation. These representations have included ship-building disputes and contractual issues, vessel collisions and other admiralty matters, products liability defense and premises liability actions and extend to trials, arbitrations, motions practice, discovery, extensive electronic productions and mediations. Clients have also sought Kelly's help with contract negotiations and indemnity issues. 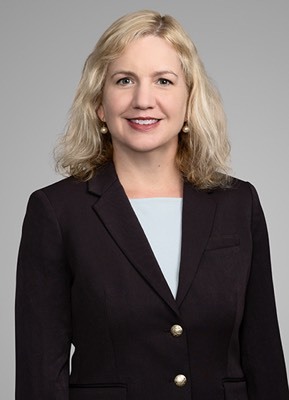 Kelly served as a law clerk to the Honorable James L. Dennis, Judge, United States Court of Appeals for the Fifth Circuit, from 2000–2001. She co-founded the Admiralty Law Section of the Federal Bar Association and has been a leader of the Federal Bar Association. We represented a local ship builder in a contractual dispute and prevailed in a 12-day jury trial. Chevron engaged us to represent the company in an on-going contamination claim involving a potential oil/gas leak. We defended litigation brought by another pipe owner in the area, in addition to handling an agency review by the Louisiana Department of Environmental Quality. We represented BP as a plaintiff in a products liability case involving piping systems on platforms in the Gulf. The firm's team conducted extensive work with experts and on-the-ground investigation. According to Kelly, "My past experience with personal injury claims is an asset that benefits clients in every phase of litigation ­ from investigation, through deposing experts and beyond ­ whether it's maritime, trucking or any other kind of major accident or loss." Kelly was a co-founder of the Admiralty Law Section of the Federal Bar Association and was elected to serve as chair, 2015-2017. She has presented on topics such as developments in maritime personal injury law and punitive damages. Kelly has also presented on contractual indemnity and insurance issues, negotiations of oilfield contracts, and ethical issues in personal injury cases. "In re Larry Doiron Inc.: The Fifth Circuit Adopts New Maritime Contract Test"
Aside from a weakness for Swedish and Norwegian crime fiction, Kelly spends her spare time with family. You might, for example, find her on the sidelines watching her sons play soccer or football…or with her family at Disney World's Polynesian Village.